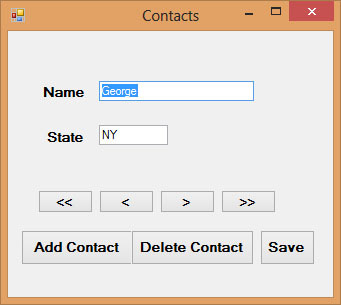 In preceding Lessons, you have learned how to connect to a database as well as filling up the table with data in Visual Basic 2015, now you shall learn how to manipulate the data in the database. Manipulating data means adding news records, editing records, deleting records, browsing records and more. In the previous Lesson, we have learned how to display the first record using the showRecords sub procedure. In this Lesson, we will create command buttons and write relevant codes to allow the user to browse the records forward and backward as well as fast forward to the last record and back to the first record.The first button we need to create is for the user to browse the first record. We can use button’s text << to indicate to the user that it is the button to move to the first record and button’s text >> to move to the last record. Besides we can use button’s text < for moving to previous record and button’s text > for moving to next record. The code above will present a new record with blank fields for the user to enter the new data. After entering the data, he or she can then click the Save button to save the data.